Social activist Datin Paduka Marina Mahathir should return the Selangor State Honours Darjah Paduka Mahkota Selangor invested to her by HRH Sultan of Selangor, since she grossly defied (Ingkar) the Sultan’s decree (Titah) on 14 December 2013 on the prohibition of Non Muslims to use the kalimah “Allah” and “Allah is exclusive for Muslims only”. She and 50 others turned up at Lady of Lourdes Catholic Church in Klang to demonstrate their support to Father Michael Chua. Marina also lambasted JAIS which she described the raid at Bible Society of Malaysia (BSM) on 2 January 2014 in Damansara Kim as “Despicable”, for the action in the interest of preservation of Islam as provided in the Selangor and Federal Constitution. KUALA LUMPUR, Jan 6 ― Datin Paduka Marina Mahathir should have joined Muslims in demanding exclusivity over “Allah”, Perkasa Youth said today when condemning her role in a rally showing solidarity with Christians at the Church of Our Lady of Lourdes in Klang yesterday. Pointing to her previous outspokenness on lesbian, bisexual, gay and trasngender issues (LGBT), the youth wing of the Malay rights group also cast aspersions over the intent of the daughter of former prime minister Tun Dr Mahathir Mohamad in joining non-Muslims yesterday in a show of support for the church that had been expected to come under protest from Muslim groups. “Did she intend to spark another controversy or simply to seek cheap publicity and at the same time issue a statement to condemn [Selangor Islamic Religious Department]? “As a Muslim, she should be with other Muslims to defend the name of Allah so that the sacred word would not to be used by Christians, to which Father Lawrence, editor of the Herald publication proudly asserted that the Christians will continue to use the word Allah,” Perkasa Youth chief Irwan Fahmi Ideris said in a statement today. Irwan also said that as a Muslim and the daughter of Dr Mahathir, who has fought for Islam and is patron of Perkasa, Marina’s actions would invite suspicion from Malaysians, especially Muslims. “I wonder where she places her faith and if she agree with non-Muslims using the word Allah. “Perkasa Youth strongly condemns Marina Mahathir’s actions,” he said. Yesterday, churchgoers at the Klang church were pleasantly surprised when Marina turned up along with some 20 non-Christians with flowers in hand during the Sunday morning mass, instead of protestors from Malay groups and Umno Selangor who had threatened massive protests outside Selangor churches for what they claimed was an attempt by Christians to usurp the exclusive right to calling their God “Allah”. The planned protest failed to materialise when the groups decided instead to rally and remain at the Stadium Sultan Sulaiman. There, Marina also said that the word “Allah” “belongs to all”. “If we believe that God is one, then the word is for all,” she said. Marina, who is also a member of the newly-formed National Unity Consultative Council (NUCC), said the council will discuss the “Allah” issue today. Aside from the threatened protests, the Bible Society Malaysia was also raided by the Selangor Islamic Religious Department (Jais) and police on Thursday. Over 300 copies of the AlKitab Malay language bibles and Bup Kudus Iban versions were seized while two BSM officials were arrested. Temperatures have risen of late over the so-called “Allah” row that remains unresolved four years after it shocked the nation and led to the worst religious strife in the country’s history. 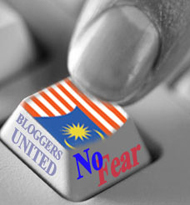 The ongoing legal dispute between the government and the Catholic Church over its right to print the word “Allah” in the Herald’s Bahasa Malaysia section is still pending before the Federal Court, which is set to hear arguments from both sides on February 24 before deciding on whether it will hear an appeal by the Catholic Church. JAIS raided and confiscated the contraband 321 Al-Kitab bibles in Malay which contained the kalimah “Allah” in place of the word God. Later, Damansara Utama Police recorded the statement of BSM President Lee Min Choon and manager Sinclair Wong. Marina should not be blind on the fact that BSM housed contraband Malay Al-Kitab bibles which used kalimah “Allah” in place of God, which has been defined in Selangor as unlawful. After all, BSM is not a house of worship but a Christian training centre. Yesterday, Father Michael Chua defied the titah of HRH Tuanku Sultan of Selangor and used kalimah “Allah” in the Malay sermon at the Lady of Lourdes Church. It should not be seen as a provocation to a situation which is already tense but instead an insult to position and role HRH Sultan of Selangor as Constitutional Head of Islam in Selangor and Islam as the Religion of the Federation of Malaysia, as per enshrined in the Federal Constitution. HRH Sultan Sharafuddin Idris Shah reiterated his titah that Non Muslims are prohibited to use kalimah “Allah”, as per the Propagation of Non Islamic Religion (1988 enactment) and Federal Constitution Articles 3(1), 3(2) and 11(4). Court of Appeal Justice Mohd. Noor Abdullah in a year 2000 judgment defined the position of Islam in Malaysia as “Islam is not equal, neither sits together, nor stands at par with other religions. However, Islam sits above, walks ahead, is located in the field and the voice is heard loud”. Therefore any attempt to antagonise the sanctity of Islam, should be punished severely under the limit of the Malaysian Law and any individuals standing up in support of the exercise to directly or indirectly antagonise the sanctity of Islam at the expense of the emotions of the majority Malay-Muslim should be reprimanded and dealt with. Church leaders in Selangor is heading on a very serious collision course with the law, by being seditious. Challenging the JAIS decision and authority to raid the Bible Society of Malaysia in Damansara Kim on Thursday 2 January 2014 and seized 321 bibles which contained the word “Allah”. January 5, 2014.What would a Christian and a lawyer of 33 years standing have to do with Islam? In most countries, nothing. But Lee Min Choon found out last Thursday that the long arm of the Islamic religious authorities can somehow extend to people of other faiths in Malaysia, despite the Federal Constitution allowing freedom of religion. His story is well-known now. On that day, The Bible Society of Malaysia (BSM) president was powerless to prevent 20 enforcement officers from the Selangor Islamic Religious Department (Jais) from raiding BSM’s premises in search of Bibles containing the word Allah. Despite knowing that Jais had no jurisdiction over non-Muslims, Lee was not even able to avoid arrest and instead, was taken to the police station like a common criminal. The Jais officials also seized 320 Malay and Iban language Bibles. “Right from law school, we were taught that Islamic authorities only have jurisdiction over Muslims. “But when I saw this bunch of thugs trying to force their way in, seizing our property and arresting me, I was utterly shocked and surprised that something like this could happen in Malaysia,” he told The Malaysian Insider. Apart from arresting Lee and taking the Bibles, Jais officials also briefly detained BSM office manager Sinclair Wong at a nearby police station before releasing both on police bail. Jais has ordered Lee to be present at their office on January 10. In the drama that unfolded just after 1pm that day, Lee recalled that a group of 20 Jais officers behaving like thugs tried to enter the BSM office by pushing and banging on its main door, which was closed for stock-taking. Having little choice, he had to let them in for safety reasons. Five Jais officers were allowed to enter, but they started ransacking and throwing around boxes containing Bibles, with utter disregard to the holy books considered sacred to Christians, Lee said. In the interview with The Malaysian Insider, a tired-looking Lee said that although he knew his rights as a lawyer, his legal skills and knowledge went out the door on the day of the incident. “As a father who is a lawyer, I have been telling my two children to believe in the system and that our laws will protect them as long as they don’t do anything wrong, but all that can be thrown out the window now,” the 58-year old added. It was not too long ago that Lee sat down with federal ministers, including Datuk Seri Idris Jala, and Attorney General Tan Sri Abdul Gani Patail to come with the 10-point solution in April 2011. This is despite the fact that the Malay translated Bibles using the word Allah has been in existence since 1612, almost 400 years before certain states in Malaysia, including Selangor, came up with enactments banning the use of certain words including Allah by non-Muslims. “The 10-point solution was a result of discussions between Christian leaders including us, the Bible Society, Idris Jala and the Attorney General who sat across the table from me. “It was agreed that the Malay Bible, Alkitab, can be distributed without restrictions in East Malaysia while for West Malaysia it must have a cross and the words ‘penerbitan Christian’ (Christian publication) on the cover, to which we have been complying,” he said. Lee also said that the Malay Bibles which are imported from Indonesia, go through a clearance check by the Home Ministry at Port Klang before they are released to BSM. “All this was going on peacefully for two years until Thursday when we were raided and taken to the police station like common criminals,” Lee said. Now, he is uncertain of what is to come, and fears the repercussions of the Jais raid could be far-reaching, just like the October 14 Court of Appeal ruling, which deemed that the word Allah was exclusive to Islam. “You could be at home spending personal time with your husband and they could kick down the door because they are looking for a book with the word Allah in it,” he said. On the court ruling, Lee said that although government ministers had come out to say that the ruling was limited to Catholic weekly Herald and was not applicable to the Alkitab, he tended to agree with lawyers who said that the ruling had a far wider effect. “We see that happening with Jais, who seem to think that since the Court of Appeal had ruled that Allah belongs only to Muslims, any non-Muslim who uses the word is committing an offence and therefore they can act. “So the lawyers were right, they could forsee the evil of the Court of Appeal decision,” he said. Lee said further proof of the far reaching effects of the court ruling was the raid on BSM and the arrests of Wong and himself. “So unless something is done to address the situation, it can happen again tomorrow, Jais can kick down the door of the church today and burst into homes looking for the Alkitab. And they have the police to provide the jails to hold all those arrested,” he said. Asked if he was going to the Jais office on January 10, Lee was non-committal and said that he had not yet plan so far ahead. But he was certain that if he did not turn up, he risked being hunted by the police. “The police bail document states that we have to appear in court on January 10 but it does not specify which court. “When I asked the police, they appeared not to know and in the end, they told me to refer to Jais,” Lee added. Lee also could not say what steps BSM could take to ensure there would be no repeat of Thursday’s incident. “What can we do, we are at the mercy of the system, the Court of Appeal has ruled on the Allah case and these people say the state law give them power over non-Muslims. “Non-Muslims are not immune to actions by Jais, that is the reality now,” he said. Lee cautioned, however, that if the matter was left unresolved, BSM would also be prevented from carrying out its objective of providing Bibles as Jais might require them to furnish details of those who obtain Malay Bibles from them. “Who would want to get Malay Bibles from us if they are going to end up on Jais’ database?” he asked. – January 5, 2014. It is simple and clear, Bible Society Malaysia (BSM) possessed contrabands. Just because once probably the authorities at the borders had an oversight, doesn’t mean they are allowed to keep stock these unlawful documents. JAIS is just administering the law, which they have the authority to do so. Lee and Opposition leaders in their statements insulted HRH Tuanku Sultan Sharafuddin Idris Shah Ibni Almarhum Sultan Salahuddin Abdul Aziz Shah of Selangor for his decree against Non Muslims prohibition to use the word “Allah”, which is “Exclusive only to Muslims”. The interpretation on the position and role of Islam as the Religion of the Federation of Malaysia by Court of Appeal Judge Dato’ Mohd. Noor Abdullah is very clear. The nationwide enactment in 1988 was designed to prohibit any attempts to prosetylise Muslims into Christiniaty. As such, the introduction of the Malay bible Al Kitab with kalimah “Allah” in place of God is a systematic and continuous agenda to protetylise Malay-Muslim in Semenanjung into Christianity. This is part of the sinister bigger agenda of these minority taking power and control of the country, which was first revealed in vows and prayers made at the post April 2011 Sarawak State Election in an event organised by DAP MP for Jelutong on 5 May 2011 in Penang to honour some of pastors who participated in the campaign. As a reaction, Opposition leaders namely the Chinese Chauvinist DAP, expressed their intention to amend the Selangor enactment. 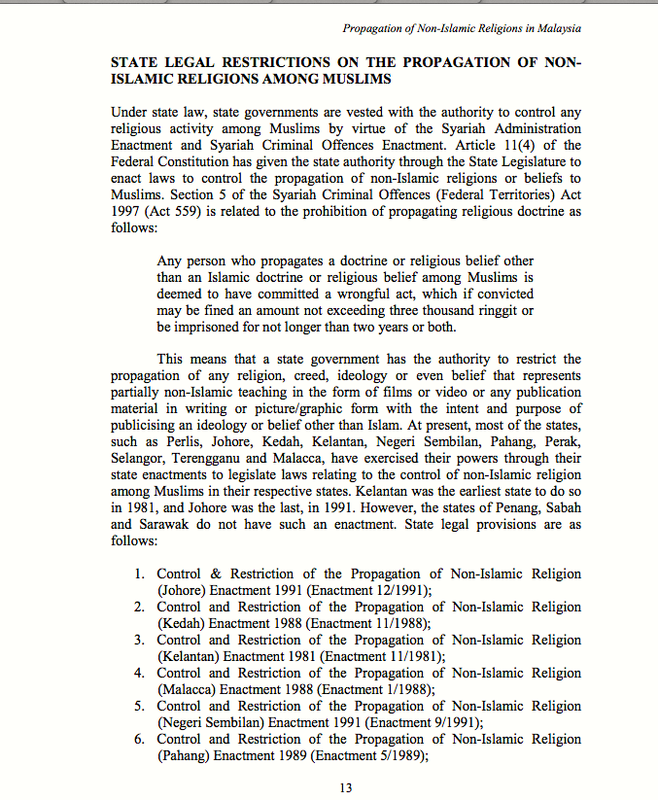 JAN 3 — We will propose to amend the Selangor Non-Islamic Religions (Control of Propagation Among Muslims) Enactment 1988 in the next state assembly sitting to ensure that Muslims continue to be protected from propagation, while ensuring that the rights of non-Muslims are protected as enshrined in the Federal Constitution. We were shocked by the unprecedented Jabatan Agama Islam Selangor (JAIS) action yesterday, raiding the Bible Society of Malaysia for bibles containing the words “Allah”. JAIS has acted in the name of enforcing the Selangor Non-Islamic Religions (Control of Propagation Among Muslims) Enactment 1988, which was passed under the Barisan Nasional regime. Firstly, we would like to remind JAIS that Selangor Non-Islamic Religions Enactment 1988 only applies to control and restrict the propagation of non-Islamic religious doctrines and beliefs among the Muslims. It shall in no way be used to restrict anyone from practicing and professing their own religions in their preferred language. JAIS reckless action serves as a wake up call for us to seek a review of subsection 9 of Selangor Non-Islamic Religions Enactment 1988, which states that a person commits an offence if he (a) in any published writing; or (b) in any public speech or statement; or (c) in any speech or statement address to any gatherings or persons; or (d) in any speech or statement which is published or broadcast and which at the time of its making he knew or ought reasonably to have known would be published or broadcast, uses the word “Allah” or 34 other Arabic words including Hadith, Syariah, Kalifah, Fatwa, Alhamdulillah, Insyaallah etc to express and or describe any fact, belief, idea, concept, act, activity, matter or thing of or pertaining to any non-Islamic religion. This section clearly contradicts Article 11 (1) & Article 11 (3) of the Federal Constitution, which provide every Malaysian the right to profess, practice and manage his or her own religion. As such this section should be amended to ensure that extreme groups will not act against persons of other faiths at their own convenience. 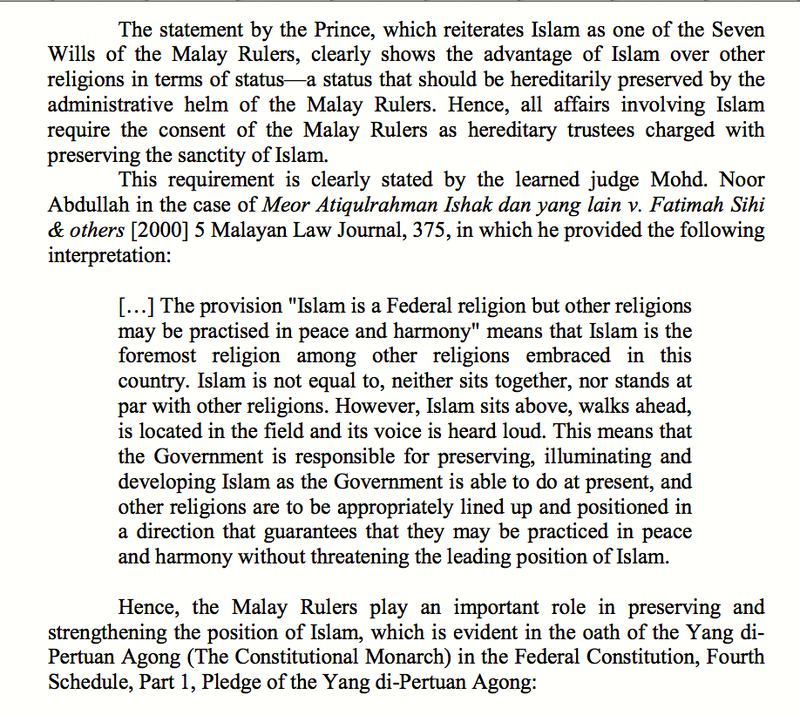 The enactment must be consistent with the Federal Constitution which states under Article 11(4) that “State law and in respect of the Federal Territories of Kuala Lumpur and Labuan, federal law may control or restrict the propagation of any religious doctrine or belief among persons professing the religion of Islam”, but does not allow for curtailing the rights of non-Muslims in the manner which they practice their own faith. We seek the support of all Selangor lawmakers to vote for an amendment to the Selangor Non- Islamic Religions Enactment 1988 in the spirit of the Federal Constitution to ensure that the rights of all Malaysians are given equal protection under the law, as conceived by our forefathers. We must not let the extremists in our midst to dictate the state and national agenda to the extent that the minorities are victimised unjustly. Let us take a bold step of change and lead Malaysia towards a bright future – a Malaysia for all Malaysians, based on the principle of equality, human rights and justice. * Yeo Bee Yin, Rajiv Rishyakaran, and Lau Weng San are respectively the members of the Selangor State Assembly for Damansara Utama, Bukit Gasing and Kampung Tunku. This is nothing but another provocation and eventually perpetuating the consistently growing insults against HRH Sultan of Selangor and the Malay-Muslim majority even in Selangor. What Father Lawrence Andrew said about some of the Selangor Christians would be defiant against Tuanku Sultan Selangor did come true. Some of these church leaders in Selangor blatantly demonstrated their utter gross disrespectful of the position and role HRH Sultan Selangor as the Constitutional Head of Islam in Selangor by defying his decree and continue to use kalimah “Allah” in the sermon in Malay on Sunday. KLANG (Jan 5): The practice of using the word “Allah” to refer to the Christian God was maintained during Sunday mass in Bahasa Malaysia at the Church of Our Lady of Lourdes here today. The church had become the centre of attention after a group of Muslims threatened to gather outside the building today to protest against the use of the word by Christians. As it turned out, there were no protests at the church. Instead a group of Muslims and other non-Christians – among them Datin Paduka Marina Mahathir – came there with flowers to express solidarity with the Christians. The Bahasa Malaysia service, led by parish priest Rev Michael Chua, was attended by some 200 worshippers. They word “Allah” was used when they sang songs and also during the sermon. “I’m grateful that the event that was supposed to arrive at our doorstep didn’t happen and we thank the police for keeping the church secure,” Chua told the worshippers. Before the service ended, Chua told them to pray for continued peace in the country and for people to show respect for one another. This is blatant insult against HRH Tuanku Sultan Selangor. It is time that the Federal Government relevant agencies (JAKIM, AGC, Home Ministry, Police) work hand-in-hand with the relevant State authorities (JAIS) and resolve this matter for once and for all. There are existing laws enough to reprimand all these seditious acts and statements. The nation cannot be divided by these deviant minority within the minority. The Malay-Muslim majority deserve the right to live in peace and harmony, without these disobedient and ungrateful Malaysians. Since all these are about blatant insults and disobedience, forget tolerance. Now it is about pushing the patience envelope right to the limit where the thin ice cracks.